The Perkins mini is a 16 cell display that works with Windows and mac computers at present. 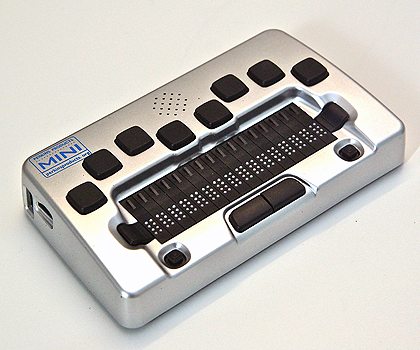 It has both USB and bluetooth capabilities, and also has very similar functions to the Braille Edge. It can take notes, read books, has a calendar, a calculator, and will be supported in iOS 6. That's where the similarities end though. Two panning keys and two small joy sticks provide access to basic notetaking functions. © 2011 the BraillerDepot, LLC | Over a Decade of Experience Integrating Systems for the Visually Impaired.